There are hundreds of things to do in Aberfeldy, the town is the bustling heart of highland Perthshire. Aberfeldy is steeped in history from ancient stones to spectacular bridges (1733) and architecture. It has pubs and restaurants serving excellent local fare as well as many galleries and more. Below is a short list of the best things to do in Aberfeldy for the day. Outdoor activities with Splash White Water Rafting. We are famous for our rafting but we also have a host of other fantastic outdoor activities, be it climbing, Abseiling, Canyoning, Stand up paddle boarding, Ducking, Paintballing or Quad biking. 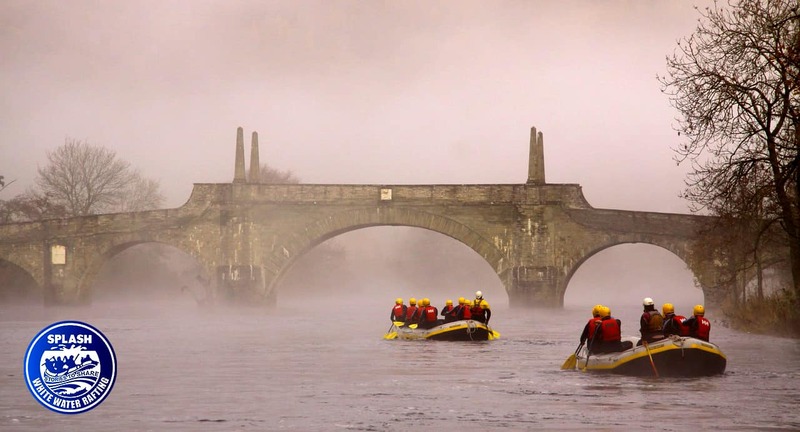 Rafting with Splash on Scotland’s longest river is an experience that starts from our base in Aberfeldy and follows the river Tay downstream till Grandtully. White water rafting on the Tay is fun and can be enjoyed by the whole family (8 years and up) it is also the very best way to see the area. You will see unfiltered natural beauty from your raft, experience adrenaline as you whip through the rapids and more. Now that sounds like fun. Book your adventure here. The falls of Moness ie “The Birks of Aberfeldy” was made famous by the national bard Robert Burns when in 1787 he penned the song “The Birks of Aberfeldy”. The birks experience was so magical that Rabie himself wrote a song about it. If this doesn’t inspire you as to the natural beauty that awaits you at the birks, then nothing will. The walk takes you on a circular path to the top of the Falls of Moness, the walk is full of spectacular sights and well worth the visit. Our “Best things to do in Aberfeldy” is just a small selection of the very best things to do in Aberfeldy. However there are lots of other fantastic sites, attraction, activities and more for you to experience in this magical area. So if you’re thinking about visiting Aberfeldy, Splash white water rafting can take the hassle out of your trip. We have an extensive network of partners around the town and wider Perthshire area. We can book you great deals on accommodation, tours, activities and more. Contact us today to see how we can help you get the best Aberfeldy experience. Call the Splash office on 01887 829706. Or if you prefer email: [email protected].